I couldn’t find the Follow quick enough. And I say Amen to that. And of course one look at her and you just have to follow that happy joy filled face. She said she nominated me “For good, and honest writing.” She’s got a direct line to the Lord, so I am not going to say she fibbed on that one. 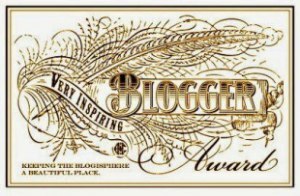 4.Nominate 15 other amazing blogs and comment on their posts to let them know they have been nominated. I have cut my own hair for over 20 years now. Imagine the money I’ve saved, not only on haircuts but all of those dates early on that said no. Think about it. Considering I have an Amen lady giving me the award, I was baptized in my 20s by a man in his late 70s. I’m 6’1” and was 240 lbs at the time. Needless to say, I was a bit skeered, but I decided that if he couldn’t bring me back up I was covered anyway. Can I get an Amen on that one? Since she mentioned it in her About The Author page, I’ll say it here. My favorite actor is Cary Grant, followed closely by Sidney Poitier. There are more similarities between these two men than you think. I’ve read biographies and autobiographies on both and taken notes. One of my favorite TV shows ever is apparently Golden Girls. Don’t ask me why, I don’t know. Add Designing Women to that and if I could actually watch TV now I would probably be happy for the rest of my life, oh and don’t forget the Cosby Show. Just like Mrs. Cindy said about not making movies like they used to, they don’t make TV shows like they used to either. My favorite candy bar is the Butter Finger but I also have an affinity for the Peanut Butter Snickers. I think you see the link. Nobody cooks fried chicken like my MawMaw. But then she can’t make homemade tortillas and grilled soft tacos either. But give me the chicken! I make an excellent homemade grilled zucchini and squash pizza. That includes the crust and sauce–homemade that is. “I suppose the thing most people notice about me [other than my charm and good looks – shh mum or I’ll put you in a home] is my generosity of spirit and my deep belief in sharing my opinion with anyone who will stand still long enough to hear it. One of her recent articles to check out is Two Thoughts this Tuesday. You just need to see her blog to see why I chose her. Anyone that has my blog over the past few weeks knows I am a fan of Amanda’s. I reblogged while she was on ‘vacation’. That turned out be not exactly the right word for it. Amanda has inspired me in the past with her humor and the way she puts a blog together. She’s one of the best. But it’s not always about humor, or not JUST about humor. She shows us more and doesn’t pull punches or hide anything in the article Amanda Does Thailand: Part One. I learned a lot from this one. I read it twice and will likely read it again. And the photography is amazing. You see Thailand not from a tour guide ad but from one of us. She’s one of us. I mean that as in she’s ‘an author in the works’. I like how she shares on her site. I feel connected in some similarities in our approaches even if we don’t end up in the same places. Plus she is great and loyal follower where she follows. I honestly think if I needed someone to help me with something, like a quick blog post or anything, I could go to her and she would help. We’ve never really been in conversations like that but her actions in what she does do just tells me that. That inspires me. Read the article The Kindness of Strangers along with her About page and you will see why I’m inspired. Again some similarities I feel between us but she has done so much with her life, including a second blog The Happy Starfish. I enjoy Steven’s site because it’s different. I like the interviews he does and the fun he has. It makes me want to explore other things to do. I have interviews in the works but his are entertaining. You ever followed someone and keep seeing them around liking the same things you do and you just seem to share the same interests? That’s Hilary and me. Wherever I go I see her there. She’s me in a more creative mind and better grasp of writing. And she looks better too. I would note one article of hers but you need to visit and choose for yourself. I like the one about How to write Haiku, oh wait, that was a reblog of my article. Ah, she has good taste too, did I mention that? Well that is it for this time folks. I chose a variety for you with true reasons behind the receiving of the Inspiration award. ← How to get your Twitter Handle to show when people Share your blog articles. Congratulations on your award! It is well deserved. I can’t thank you enough for all the support you have given me over the past couple of weeks. You have really shown me what blogging is all about; which is – making connections with people, and supporting one another! You really are, one of the best bloggers i have know, and I say this with sincerity. Your introduction of my blog was just great. It really made me smile. No scrap that…it really made my day! Keep on blogging, my friend! Keep on inspiring, and keep on being you! Congratulations again, dear Ronovan! And thank you for your kind words. I am humbled by your gracious words about me. I feel as though I have made a dear friend and I’m so glad that I’ve found one in you. Blessings to you.always. I don’t know what to say…Congratulation and Thank you for your kind words. Congratulations 🙂 Hey I love the Golden Girls too! I’m still quoting Dorothy to this day! I found new friends in your nominations, thank you! Anyone that can put up with/read my ramblings is a friend indeed! And my teacher peeps will always have a special place in my heart! What did you teach? Where and for how long? I taught History for a few years in an Alternative School. The Go to this school or go to jail ones, combined with 50 year olds wanting a high school diploma, the I want to graduate early ones, and the I came from another state and need a class ones. And yes ages 15-50+ all in the same classroom. NO WAY! I’m teaching at our district’s alternative school. But it’s just the got in trouble kids – no acceleration or continuing education. It really was a punishment from the former superintendent that was being vindictive, but it’s been a blessing in disguise (I was the HS math department chair). Congratulations on the award, Ronovan. I’m with you on The Golden Girls. I don’t know how many times I have watched every episode, but I do know that I laugh so much when watching them, that tears run down my face from all the laughter. You may have seen my recent post when I took my time machine back to 1985 to pay those girls a visit. That’s how much I love them.